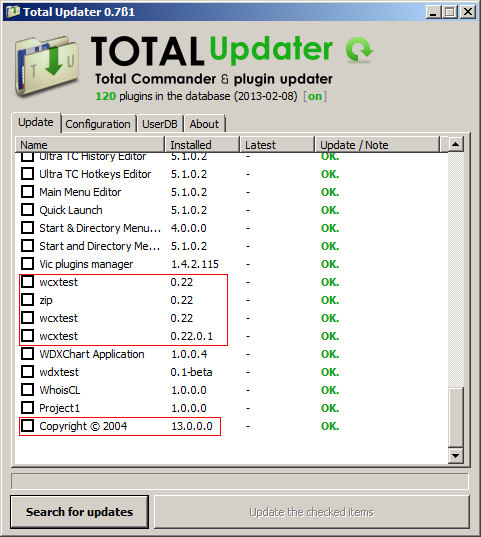 If you are using dozens of plugins for TC / always wants to be sure that you are using the latest version of our beloved filemanager, then this software is definitely for you. You can check the complete list by clicking here. Do you feel you could translate this utility to your (native) language? It's actually pretty easy - just download this language file, unzip & open it with Notepad (or any other lightweight text editor), then post the finished work here, or simply PM / mail me, and your language file will be in the next public version. Important notice: by copying "TotalUpdater.lng" file to the software's main directory, it automatically loads this file instead of the language file depending on the system language, so you can test it. Bluestar wrote: Special thanks to the Totalcmd.net Staff, especially to Flint for his server-side scripts & loads of help, and to Andrei for the approval of server usage. 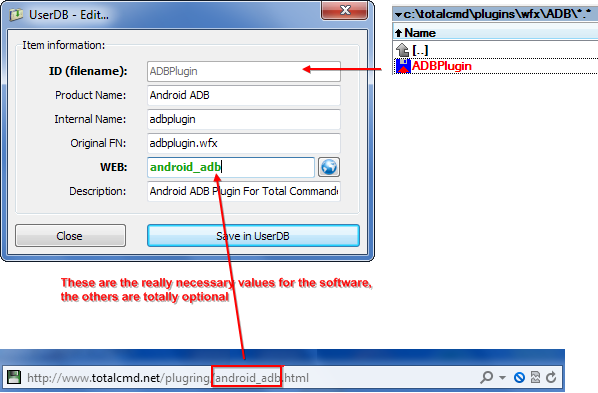 You can also save your own UserDB entries to improve the online version detection - here you can find a simple guide which helps to correctly fill a new UserDB entry: Click here for the image (you simply need to find a plugin's webID on totalcmd.net using Search). Hope you like the utility - questions, comments, feature requests & bug reports are very welcomed. Last edited by Bluestar on 2015-04-12, 21:54 UTC, edited 134 times in total. After a long time of development phase, and lots of previous mentions here and there about this tool "coming soon", I thought finally its time to make it public, so this great community can test the whole thing. I would really appreciate your feedback, feature requests & bug reports - the more reports I get, the faster it gets out of BETA phase to final. Last edited by Bluestar on 2013-02-14, 15:48 UTC, edited 8 times in total. 1) When I press "Search for updates" it give me error "List out of Bounds"
STOP! Does it has support of 64-bit plugins??? Could it be because in my work environment we utilize a proxy and Total Updater has no related parameters to configure? Anyhow, tool's layout and functionality looks very promising. Keep up the already good work. 1) My wish: Please make the window resizable. 3) When I click Serach for Updates it opens a list.txt in notepad. 4) It does not show plugins from wincmd.ini with environment variables, e.g. Thanks for all of your feedbacks & remarks. It seems I forgot to expand the envvars inside plugins paths - will be corrected soon. I think thats whats causing errors for most of you atm (since all of the 5 PC's I was testing the software on were using absolute path vars in wincmd.ini). @starix: It detects & supports 64-bit plugins too. So they shouldn't cause any problem. - By the way, the multiple items are not an error: e.g. NirCmd has two exe files, "nircmd.exe" and "nircmdc.exe", both with absolutely the same version informations. I can't ignore any of them from the list in such cases, for example cause these items could be unique tools too, with unique online IDs. Now thats what I call mysterious. In the whole sourcecode theres absolutely no reference for any "list.txt" at all, so I wonder why it opens this file. Are you using x64 Windows (7 / 8 )? And is the file empty after it opens? For all of you having "List index out of bounds" errors - does it helps if you check the "Disable the automatic detection of all kind of plugins" option for test reasons on the Configuration tab, then refresh the list (Ctrl + R) and search for updates this way (so TC is the only visible item in the list)? Or it still keeps showing "List index out of..." errormsg this way too? Could you please test it? Bluestar wrote: Now thats what I call mysterious. In the whole sourcecode theres absolutely no reference for any "list.txt" at all, so I wonder why it opens this file. Are you using x64 Windows (7 / 8)? And is the file empty after it opens? No, the list.txt is not empty. 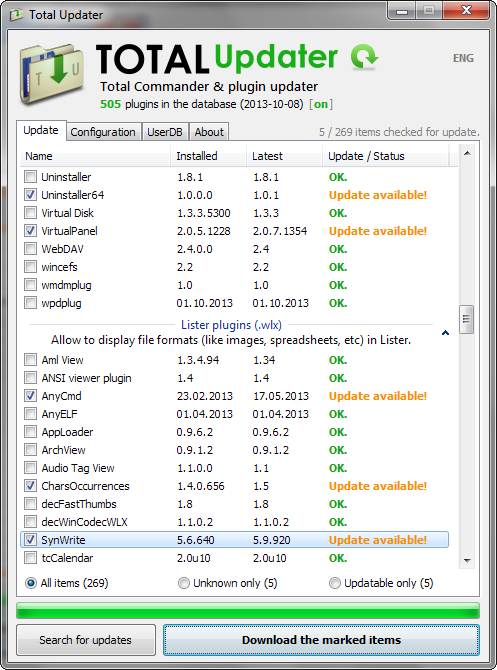 It contains 866 lines of the available plugins. I checked where Copyright 2004 comes from: It is the xcd.exe from http://www.ghisler.ch/wiki/index.php/XCD. I guess an additional column (or tooltip) which file (or file path) the version is read from would be very welcome. Last edited by tbeu on 2013-02-09, 11:17 UTC, edited 1 time in total. 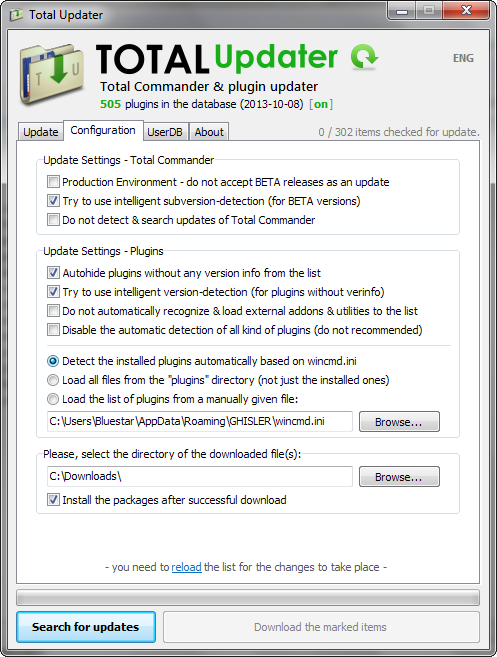 Bluestar wrote: For all of you having "List index out of bounds" errors - does it helps if you check the "Disable the automatic detection of all kind of plugins" option for test reasons on the Configuration tab, then refresh the list (Ctrl + R) and search for updates this way (so TC is the only visible item in the list)? Or it still keeps showing "List index out of..." errormsg this way too? Could you please test it? but some error on downloads. Last edited by Bluestar on 2013-02-08, 20:03 UTC, edited 1 time in total. Quickfix containing improvements regarding detection of 64-bit TC, and some other critical bugfixes. 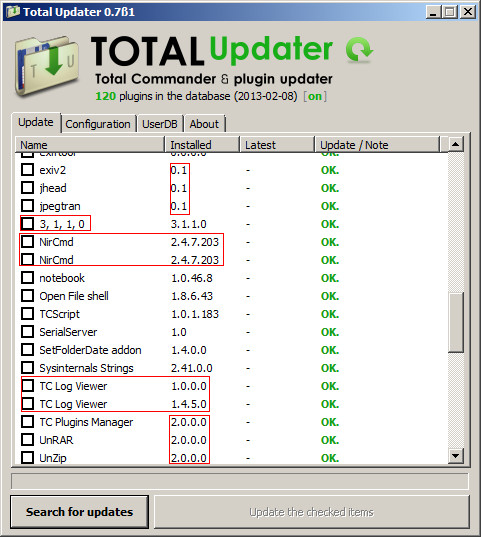 Note: If you find any bugs, please try to run Total Updater directly from TC, so this way the software can surely get the most important parameters (path to inifile, path of exefile, etc). BIG feature request - I have redirected all my plugins setting from wincmd.ini to plugins.ini - could you PLEASE make Total Updater support redirection? I have tried to use the function: "Load the list of plugins from a manually given file:" to try to load from my plugins.ini file - but it doesn't work - what is the format of the content of such an manually given file? If I try to change the UpdateList_OK= string, then nothing is changed except that the color of OK. is changed to black in stead of green. BIG feature request - could you PLEASE make possibility to use of environment variables for paths in "DownloadDir=" and "[ExceptionList]" too, because I use portable Total Commander and these paths may be various on different PC. @petermad: Thank you very much for the Danish language file, it will be included in the next version. In theory the software is able to handle "RedirectSection" vars of the plugin sections as is now (i just tried it, works perfect for me) - in case it contains absolute path to a file, without env.vars (whoa, I need to expand envvars a lot more places...). By the way you can give the path to (a copy of) wincmd.ini without RedirectSections to the function you asked about, so it can successfully load the list from the alternative wincmd.ini (generally I implemented this feature for cases when the software can't properly detect the correct path of wincmd.ini file for any reason - so it uses the format of wincmd.ini, and loads the plugins from [PackerPlugins] etc sections). About that second, dialog caption: You are right, these lines needs to be in the language file - I just updated the language pack on the server, and the next version will support them ([CaptionsDialog] section). 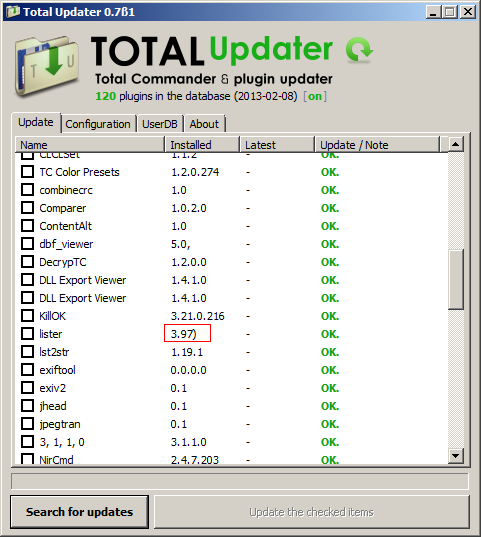 The "UpdateList_OK" string is not properly loaded from the language file, will be fixed as well - thanks for the report. @Tichij: Glad you like it. Of course I can, BETA3 is going to support it. Edit: Soon (hopefully this weekend) I'll be able to test it under fully 64-bit environment, so more related bugfixes coming soon. Last edited by Bluestar on 2013-02-09, 19:30 UTC, edited 2 times in total.